As the new Digital Research Studio Director for the Mellon DH Grant, I want to ensure that our community has a clear sense of direction and purpose. Consequently, the DH team met for a visioning and planning retreat at the end of November 2016 to craft a shared vision statement and chart a course for the remaining two and half years of the grant. I’m excited to share this vision and the process we used to develop not only the vision statement, but also plan our activities, as well as define our roles and responsibilities as team members. This clarity has already paid dividends by helping us set priorities for our busy spring 2017 semester and determine which tasks each person will carry out to fulfill our mission and enact our vision. DH@CC is an open, inclusive community that welcomes all members of the Claremont Colleges, regardless of their status or position. It is collaborative, affirming, transformative, and provides space to experiment, fail, learn, and grow. This community brings faculty, students, librarians, and staff together to produce and share knowledge as well as scholarship that meet the high academic standards of the colleges. We brainstormed one idea per sticky note and then sorted them based on similarity/affinity, adding related ideas around the sticky notes. The DH team at the Claremont Colleges has already begun actuating this vision through the activities we have planned for the spring semester. Our theme for this year’s Spring Symposium is “Critical DH.” Our guest speaker and faculty presenters will discuss the ways in which they have engaged digital tools and methods in their courses and scholarship to shed light on and battle injustice. Other presentations will describe digital projects that seek to share stories of hope and document courageous people who have stood up for other members of the community who were being harassed and mistreated. Additional planned activities this spring address the inequities of the digital scholarship world itself. One of our Digital Scholarship Fellows is documenting best practices for inclusive hackathons and plans to host at least one this semester. His goal is to lower barriers to entry and reach to women and students from under-represented backgrounds, cultures, and ethnicities who are interested in learning to program or using their programming skills to make meaningful digital products. What is more, the DH team has already begun to build a transformative community of practice that upends traditional academic hierarchies by involving and honoring the contributions of not only faculty and students, but also educational technologists, instructional designers, administrative support personnel, librarians, and staff members. This has made the Claremont Colleges DH center a rich and welcoming place for all who are interested in extending the possibilities and reach of their work in knowledge creation, scholarship, and instruction. These inputs make workshops, talks, professional learning communities, consultations, tutorials, and publishing possible. They also keep the physical spaces that comprise the DH Center, the Digital Tool Shed and the Digital Research Studio, running and providing important services. The DH@CC team members are not the only ones who fulfill these essential functions; librarians and the library staff also devote time to planning, skill sharing, and outreach. Together, this allows the DH@CC team, broadly writ, to support the teaching, learning, and research needs of their faculty, students, and staff, enabling them to take advantage of the opportunities and meet the challenges of scholarship and the job market in the twenty-first century. 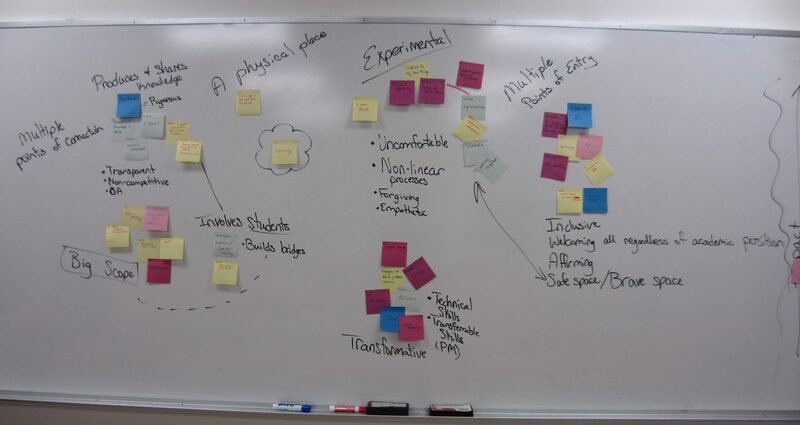 This game began with brainstorming every activity the DH@CC team has or could engage in – one idea per sticky note. 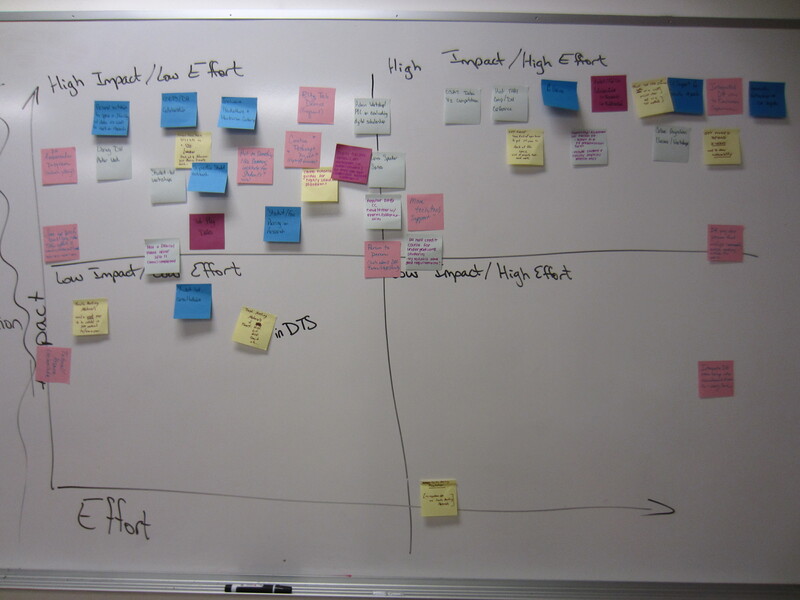 With handfuls of ideas, we placed each sticky note in a matrix based on how much impact the activity would have and how much effort would be required. Few ideas had little projected impact, but many have or will require a great deal of effort. The next challenge was to develop a manageable plan to complete our desired activities. We began to sort the high impact/high effort activities first because we knew they would be the most challenging. That forced some difficult decisions, and we eliminated some of the brainstormed activities. The first to go was one-on-one support for faculty research and projects because it is not feasible or scalable. The students’ “Creative Pathways” is also not directly related to the mission of DH@CC. This project also needs to set a clear purpose and path before the DH@CC team can reasonably consider adding it to our workload. Making presentations at faculty meetings was the third idea to be cut, as it was not deemed worthy of the time and effort. Instead, sending a 1-page summary of the main points for faculty to read was suggested as more effective and efficient. Student-faculty pairing based on research interests: This will happen ad-hoc as opportunities arise. Spring 2017 will be a busy semester. What follows is an overview of the work to be done between January and May 2017. Create information page for the faculty. This will be really helpful and shouldn’t take long, but it’s not quite as important as the items on the high priority list. 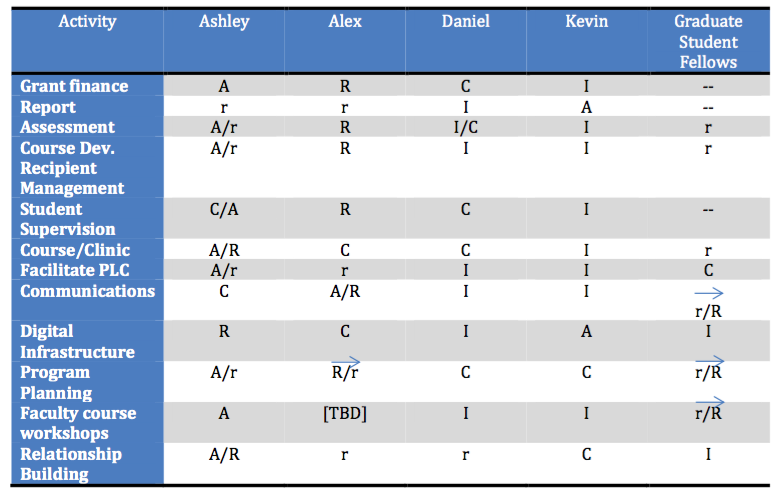 The table below is called a RACI matrix and provides an overview of each person’s roles and responsibilities. A: Accountable. The accountable person is the individual who is ultimately answerable for the activity or decisions. This includes ‘yes’ or ‘no’ authority and veto power. There should only be a single “A” for each activity. C: Consult. This person is kept in the loop and consulted before a final decision is made or action taken. This is a predetermined need for two-way communication. Input form the designated position is required. I: Inform. This individual needs to be informed after a decision or action is taken. They may need to take action as a result of the outcome. It is one-way communication. The arrows above some of the notations indicate the shift in responsibility we would like to see take place after we have additional graduate assistants on board.